The secret ingredient to these vegetarian tacos is our Umami Rich Mushroom Stock, which adds a creamy richness and deep flavour to the braised mushrooms and beans. Preheat the oven to 220 degrees. Toss the sprouts in a few tablespoons of oil and sea salt and cracked pepper. Roast for about 30 minutes, until crispy. Meanwhile, heat a little olive oil in a large saucepan of fry pan. Add the garlic and onion and saute on medium heat for two minutes. Add the mushrooms and toss around for about 3-4 minutes. Add the cannelini beans and the mushroom stock. Cook for about five minutes, until the mushrooms are soft and the liquid reduced. Don’t worry if there’s a lot of liquid now, it will cook off and then thicken up as the mixture cools. Season the mushrooms with salt and pepper and toss through the chopped parsley and half the feta. 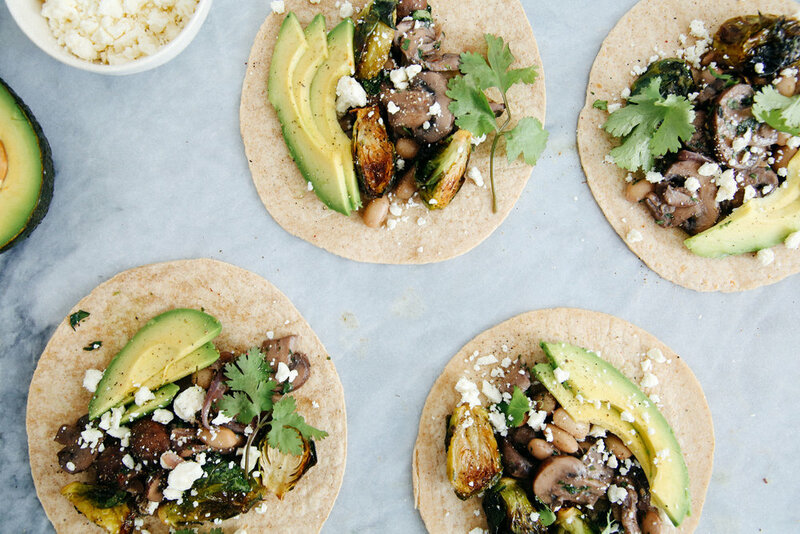 Serve the tacos stuffed with the sprouts and remaining feta, coriander and avocado slices.